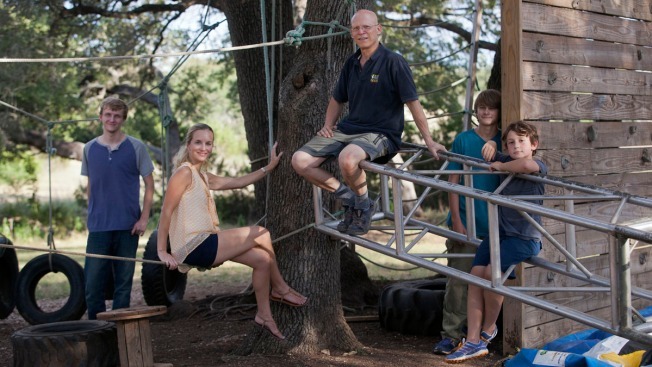 This Aug. 25, 2013 photo shows Steve Wolf, a self-employed stunt and special effects coordinator for film and television, who lives with his wife Maegan and their sons Clayton, 16, Paxton, 12, and Dashton, 8, in Austin, Texas. The Wolf family worries their income is too high to qualify for new tax credits implemented under the Affordable Care Act. As many as nine in 10 Texans buying health insurance on the new federally run exchange will get a break on costs, according to federal health officials. Steve and Maegan Wolf won't be among them. The Wolfs, who live in an upscale area outside Austin, make too much money to qualify for tax credits that will help other people afford coverage. That leaves them wondering how much they'll wind up paying. Steve Wolf, 50, coordinates stunts and special effects for feature films and TV shows. Last year, he helped the Discovery Channel blow up scale replicas of the Hindenburg. He owns Stunt Ranch, where schoolchildren come to learn about the science and math of movie stunts. His wife, 34, is a full-time mom who spends many hours each week getting their three boys, 16-year-old Clayton, 12-year-old Paxton and 8-year-old Dashton, to school, swim lessons, speech therapy and math tutoring appointments. Like many who run family businesses, the Wolfs' annual income varies, but it's typically $115,000 to $140,000. That means they make too much to be eligible for the tax credits that will help some Americans pay for health insurance under the Affordable Care Act. They also worry that changes in coverage required by the law will mean their premiums will increase. That includes setting minimum coverage requirements for insurance companies that go well beyond what many offer now and prohibiting insurers from banning those with pre-existing medical conditions. The Wolfs have purchased their family's health insurance on the individual market for about 12 years, during which time their premiums have risen steadily. They now pay about $650 a month for insurance. And while their general health is excellent, each of them has had their share of medical expenses. Their policy has a $5,000 annual deductible for each adult, meaning the Wolfs in many years have had to pay $10,000 out of pocket toward medical bills on top of the $25 copays for doctor visits and $20 copays for covered generic medicine. Next to their mortgage ($2,300 a month with property taxes), their health insurance is one of their biggest expenses. Private school for two of the three boys adds nearly $3,000 per month. One of the boys is both dyslexic and has celiac disease, requiring additional educational and grocery expenses. There also are bills for life insurance, orthodontia, utilities, cellphones, car insurance for a teenage driver, and home and auto maintenance. "When all is said and done, we live well, but there is no money left over," Steve Wolf said. "Any increase in health insurance costs will create a financial strain. "But I keep it all in perspective. Unlike most people on the planet, we've never missed a meal, been unable to find safe drinking water, lacked for a home to sleep in or had to go without medical care. So while this pinches us in the pocket, I'm very lucky to have these problems." Based on the Kaiser Family Foundation's online calculator, the Wolf family's annual premium costs for health insurance would be almost double their current costs if they purchase a benchmark plan through the federal exchange that will be offered to Texas residents. If a yearly income of $130,000 is assumed, the Wolfs would pay an annual premium of $14,804 for the mid-range insurance plan, called a Silver Plan. Their current annual premium is about $7,800. Instead, they could buy a less comprehensive Bronze plan for $12,270 a year. Or they would be eligible to purchase catastrophic coverage for even less, although it's not clear how much this type of coverage would cost the Wolfs. A catastrophic plan would cover only preventive care. All the plans would come with an annual cost-sharing limit of $12,700 for the family, meaning they wouldn't have to pay more than that out-of-pocket after paying their premiums. Many health care expenses aren't predictable and there is risk inherent in choosing a plan with a higher out-of-pocket costs and lower premiums, but the Wolfs are willing to take their chances. "Despite our experience, we continue to hope that we'll have low out-of-pocket expenses, so we'd rather have a lower premium and the possibility of low costs than to be locked in to higher premiums that cover services that we might not use," Steve Wolf said.